Cross-posted from the Making All Voices Count page for the publication and the MIT Gov/Lab page. 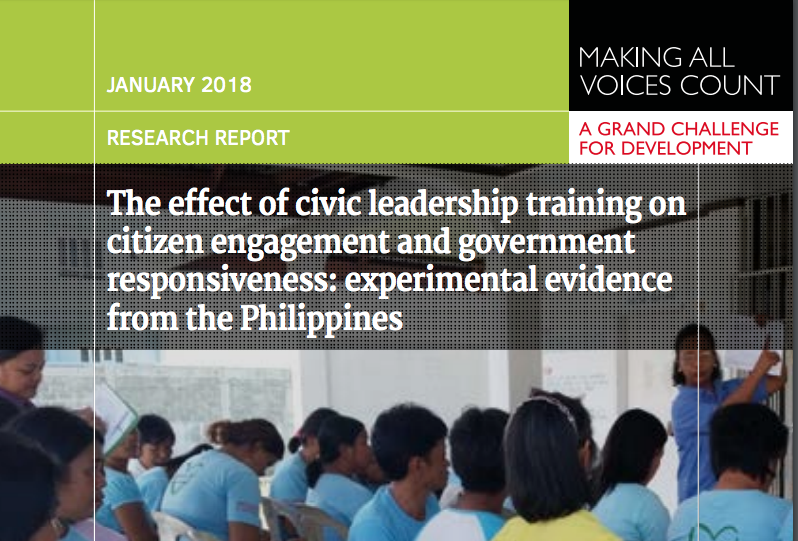 An MIT study published January 2018 finds that citizen engagement training and support for parent leaders (community facilitators) in the i-Pantawid project led to economic and political empowerment of communities and increased local government responsiveness. The i-Pantawid project is funded by the Global Partnership for Social Accountability and is being implemented by Concerned Citizens of Abra for Good Government (CCAGG) with support of Partnership for Transparency (PTF). CCAGG and PTF provided support for this research. The formation of parent leaders from among CCT beneficiaries is a unique feature of the Philippine Conditional Cash Transfer Program monitored in the i-Pantawid project – transforming parents from being simply the conduit of information between the Department of Social Welfare and Development and the beneficiaries to being practitioners of social accountability and becoming facilitators for change in the community. Parent leaders are able to mobilize their fellow grantees to active citizenship and to demand action from local authorities. What then is the impact of this intervention on Parent Leaders, CCT beneficiaries, local authorities, and the Pantawid Pamilyang Pilipino Program (4Ps)? The MIT Study provided the evidence of impact attesting to one major success of Project i-Pantawid. PTF was instrumental in having the MIT/GOVLAB undertake the study and contributed to the development of research design and initial implementation. This was acknowledged by the MIT/GOVLAB team during presentation of research results to the Project Management Committee and its implementing local civil society organization partners. Civic leadership training for parent leaders increased their political participation and engagement. Researchers tested the impact of civic leadership training on 12 outcomes that measure political engagement. For 11 out of the 12 outcome measures, the treatment and control groups showed a difference in the expected direction. The consistent pattern across so many outcomes provides suggestive evidence that the training increased political engagement among parent leaders. There were changes in government responsiveness. While there was little difference in citizens’ perceptions of government responsiveness to their complaints and concerns, local government officials in the communities where parent leaders were trained complied at higher rates with government transparency regulations. There was no evidence of parent leaders being co-opted. In fact, reported rates of co-option, measured with a series of questions about election-related engagement and personal assistance received from officials, were lower on average in the municipalities where parent leaders had been trained. This research was undertaken by MIT Gov/Lab authors, Lily L. Tsai, Nina McMurry, Swetha Rajeswaran, with the support, guidance, and hard work of Concerned Citizens of Abra for Good Government (CCAGG) and Responsible Citizens, Empowered Communities in Solidarity for Social Change (RECITE, Inc.), and the Partnership for Transparency (PTF),with special thanks to Pura Sumangil for her leadership and to Ester Alkonga and Bing van Tooren for their intellectual contributions and unflagging enthusiasm. Read more about the program this research covers at i-Pantawid: Guarding the Integrity of the Conditional Cash Transfers.